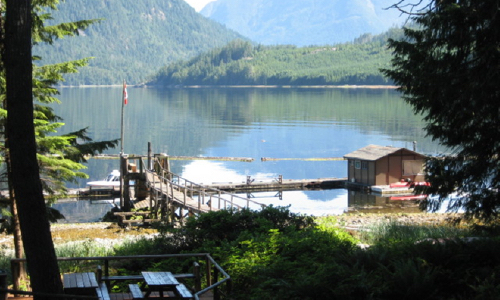 Tzoonie is situated on the shore of Narrows Inlet, the jewel of the Sunshine Coast. 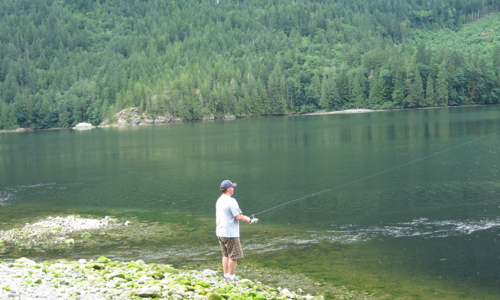 The resort is located in an oasis of mountains, sea, and old growth forest. The pristine wilderness offers kilometres of beach and shoreline rich with shellfish, asparagus and many varieties of marine life. 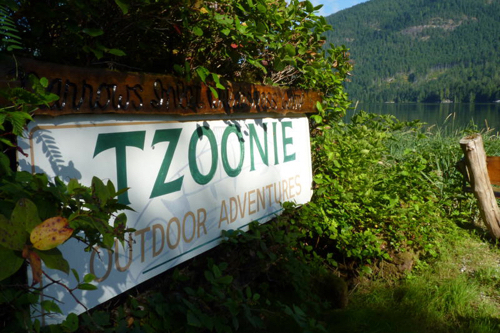 Tzoonie is only accessible by boat or floatplane and they provide the boat access. These features ensure privacy and solitude. The resort is ideal for family reunions, business and spiritual retreats, romantic getaways, and weddings. With over 30 years of operation, your experienced hosts ensure safety and optimum enjoyment during the “hands on” learning experience that is part of your wilderness adventure. Leave the stress, traffic and busy lifestyle behind for a “digital detox”. Enjoy most recreational activities including kayaking, canoeing, paddle boarding, hiking, biking, swimming, beachcombing, and much more. 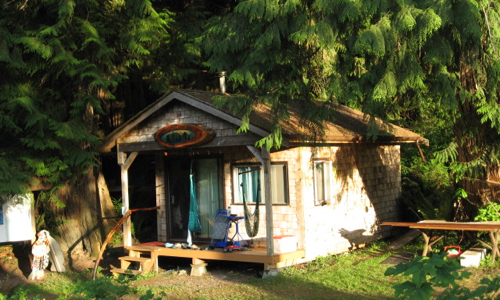 Tzoonie offers lodging in waterfront cabins and comfortable roomy tent cabins nestled beneath the shade of giant old-growth cedar, fir and maple trees. Every accommodation offers a peaceful waterfront view of the spectacular Inland Sea and Narrows Inlet. Guests enjoy use of full kitchen and dining room facilities, washhouse, flush toilets, sauna, covered fire pits, oyster shack, and many other resort services. 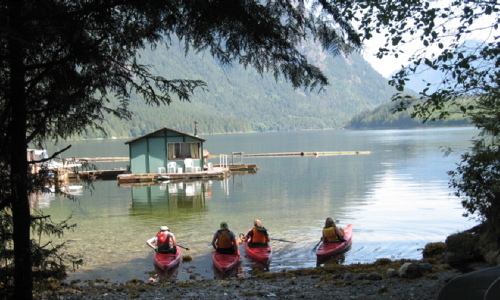 Enjoy the spectacular beauty of the protected Inlet whether kayaking, canoeing or paddle boarding. Narrows Inlet is the preferred destination of many paddlers, most of whom must travel with tents and camping gear for a day or two just to get here. You are already here and able to devote all your time to leisurely explore the many places of interest. Visit “seal reef” and drift with the inhabitants. View Aboriginal pictographs under the watchful eye of our resident mountain goats and eagles. Paddle amongst the many varieties of sea birds, sea and river otters, sea lions and frequently dolphins and Orca whales. 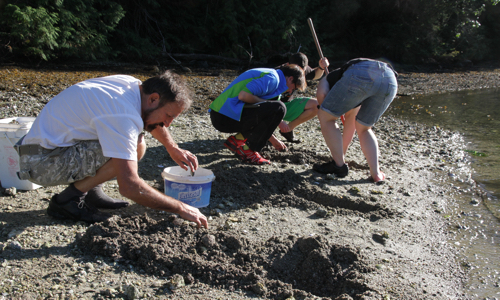 Visit Tzoonie Marine Park and continue on to the head of Narrows Inlet and the gorgeous Tzoonie River. 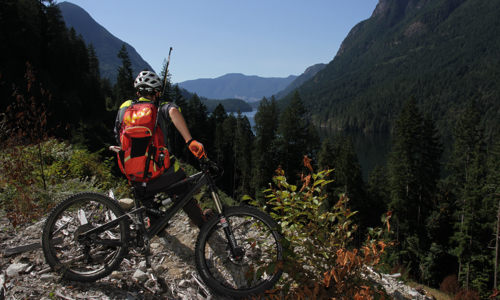 Whether on foot or bike, explore Tzoonie's groomed trails and many kilometres of abandoned logging roads which offer spectacular views and unlimited opportunities to view and film wildlife, plant life, and enjoy the many varieties of berries and mushrooms. 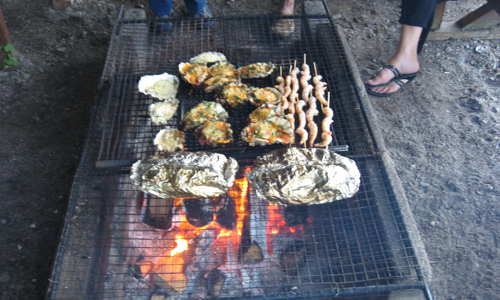 A very unique feature of the resort is the abundance of shellfish and marine species along many kilometres of beach. Guests can gather oysters, clams, mussels and sea asparagus to feast on later in the day. Tzoonie provides the tools and expertise. 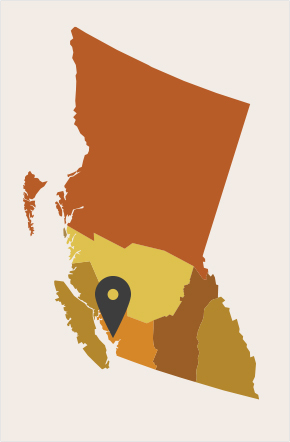 Most inlets on the West Coast have the resources to provide fishing for ling cod, rockfish, red snapper, etc, however Narrows Inlet also has an abundance of sea-run cutthroat trout making their way to the Tzoonie River to spawn. These fish can be taken by fly, spin casting or trolling. Many of our paddlers troll from kayaks or canoes. You can also fish for perch from our docks to bait the crab traps. Arrangements can also be made to transport guests the 16 kilometers to the head of the Inlet and the Tzoonie River where you can hike or bike along the banks to favorite fishing holes. Visit their website for more detail. This has now been added to your Trip Planner.